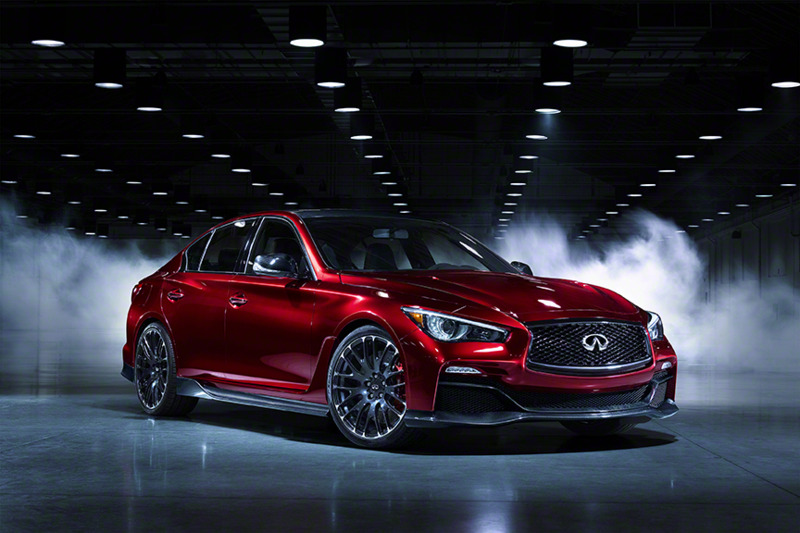 Ahead of an expected production confirmation at the Beijing Auto Show later this month, Sebastian Vettel has been behind the wheel of the F1 inspired Infiniti supersaloon. It seems an ever-increasing likelihood that we’ll see a production version of the Q50 Eau Rouge, named after the infamous uphill bend at the Spa-Francorchamps race circuit. Previewed at the recent Geneva Motor Show, further details have since been released such as the fact the concept makes use of the engine and drivetrain seemingly lifted straight from the Nissan GT-R.
With the 3.8 litre twin-turbocharged V6 producing 560 bhp and 442 lb-ft of torque, performance should be suitably impressive, especially as the Eau Rouge is said to use the four-wheel-drive setup from the GT-R. With the switch to turbocharged engines for this year’s Formula 1 championship, a forced induction V6 would give Infiniti an obvious link between the race car and the road car it is said to have influenced. Given the woeful performance so far of the Renault Sport F1 ‘power unit’ fitted to Vettel’s 2014 RB10, fitting the Nissan GT-R unit to his race car might actually be an improvement. 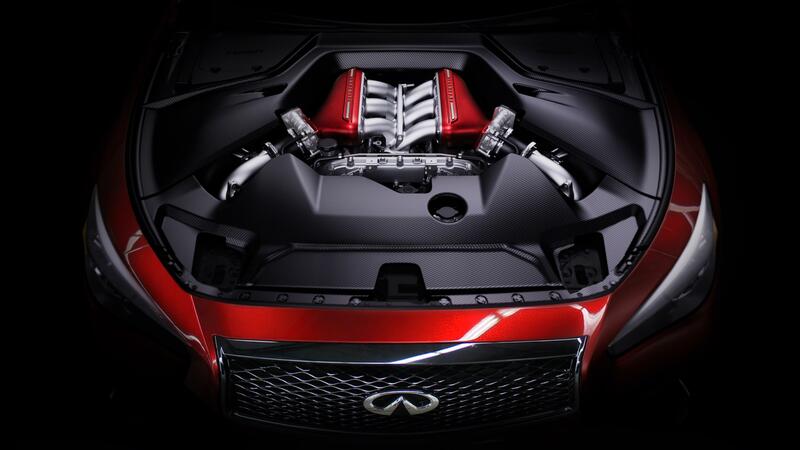 Whether anyone would actually buy the Q50 Eau Rouge, despite the big power potential, is another question. In the UK, and Europe as a whole, the brand is still accounting for only small sale percentages. But globally, in locations such as China, the brand is growing with sales increases of 50% year-on-year, with that market set to become the company’s biggest market by the end of the decade. The fact that the Eau Rouge is being shown off at the Beijing Auto Show probably tells you all you need to know about the cars intended audience. Nissan is trying hard with the Infiniti brand, and likes to play on the association with the Red Bull F1 team. 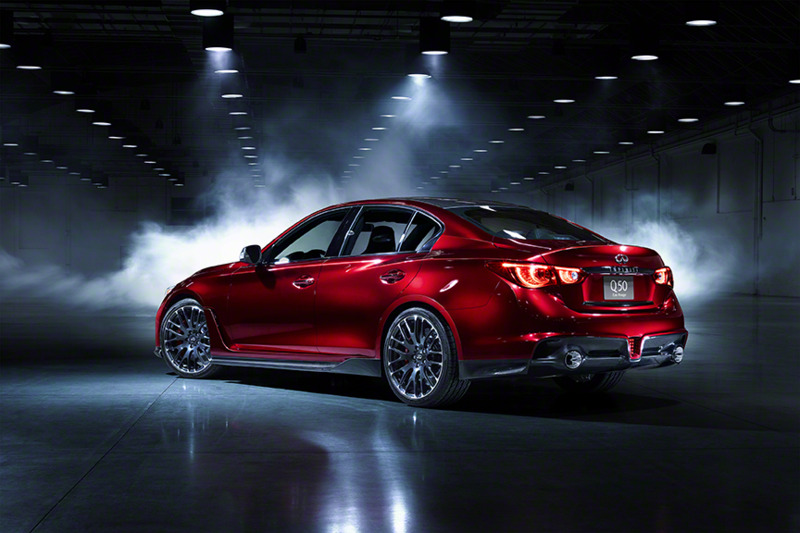 Whether that can truly translate into sales, especially given the current on-track performance, remains to be seen. Regardless, we expect a production version of the Q50 Eau Rouge to be confirmed very shortly; just don’t expect to see many hit these shores.